When you first start scything it can be difficult trying to decide what equipment you will need and the choice of blades can be daunting. Over the years of my own mowing and teaching I have assessed the various combinations and now offer a kit which includes everything you need to start to mow and look after your new scythe. These are the kits which I provide for all my Learn to Scythe courses and are available to buy from me during the courses. By buying a kit on the course you will take home a scythe which you have set up under guidance to fit your body and mowing style with the confidence to use and sharpen it and get mowing straight away. I carry out the preparation work on all my kits for you in advance so you are ready to start mowing. I oil the wooden snaths to protect them, clean the lacquer from the blade as well as sharpening the edge to ensure your scythe is at its sharpest when you receive it. Although I recommend getting proper training I accept that some people simply want to buy a scythe without the course and I sometimes have spare kits to sell. 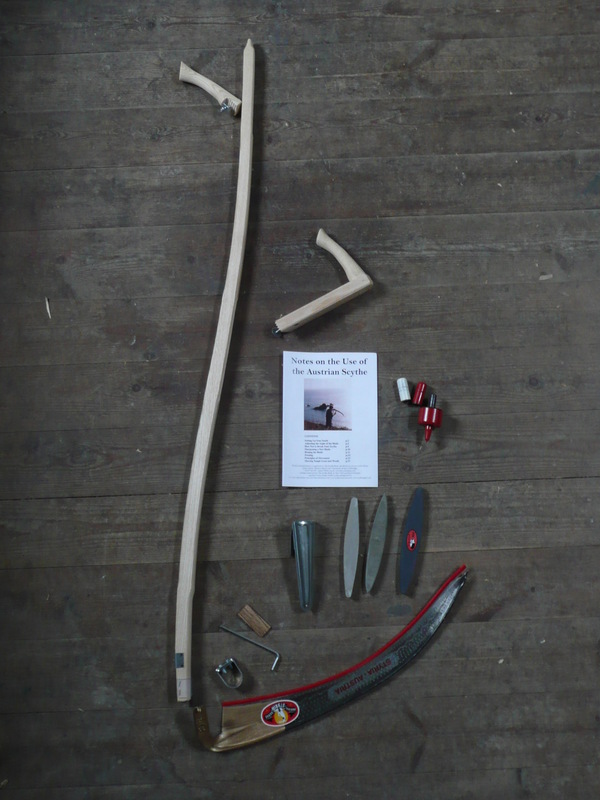 While you collect your scythe, why not invest 30mins when I can show you how to set up the snath and blade, avoiding the most common cause of problems for £25. Please email me to arrange a time for collection from me in Stretford, Manchester. Why the 65cm Ditch scythe blade? The Ditch blade is an all round blade capable of clearing weeds or cutting grass. While it won’t leave the smoothest cut to your lawn, its design makes it robust enough to cope with tough work, less likely to dig into the ground and easier to handle for beginners. A 65cm blade is small enough to maneuver around the garden while also coping with larger areas. Why do I need 2 whetstones? The natural, fine grit stone is used in the field for honing the blade as you work while the artificial, medium grit stone is used to sharpen the blade after peening, especially when using the jig. Both stones need to be wet when used so carry them on your belt with a small amount of water in the galvanized metal sheath. Peening is the process of reshaping the scythe blades edge to a fine angle which is required periodically after sharpening with the stones. The steel of the blade is cold hammered to thin the metal and shape the edge. The best peening is carried out freehand using a special hammer and anvil but this is an extra skill in it’s own right and easy to get wrong. The peening jig was developed specifically to simplify the task and produce a good working edge with less chance of damage. 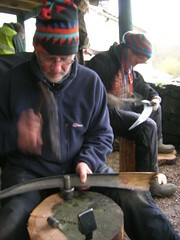 If you want to learn more about peening your scythe, including the use of hammer and anvil why not book a place on my dedicated Peening course where you can learn to shape your blade under expert guidance.